Ananka's Diary: What Do You Suppose is Down There? OMG! I smell another secret city . . . . . . . . . I heard about this yesterday. It swallowed a 30 story building!!!!!!! I hope there's a shadow city down there! When I first saw that image I was like "HOAX!" but I tend to believe NatGeo, and there are too many images. 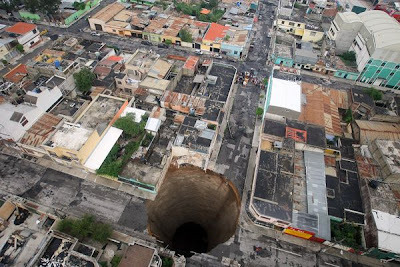 guatemala seems to be the place for sinkholes. if you type in 'sinkhole' in the little search bar in the top left corner, there is an old post about another sinkhole in guatemala. it even has a similar heading/title. I heard about this on world news! It is so weird! But very interesting! I worried about the people who owned the property. I saw that picture in the newspaper! The sinkholes (there are more than one) were caused by a tropical storm that went through the area. Lets all go over there and climb down inside it! yesSSSS!!!!!! lets all go explore the sink hole!! I was going to send you this! but then I didn't have time, But know that I thought of you when I saw it. Must be a really big rabbit to make a hole like that. Curiouser and curiouser. What makes it so perfectly . . . round? I wonder if one has ever opened up right under someone. How quickly do they form, does anyone know? just wondering... will there b a third kiki strike book? When I heard about it first, I immediatly thought of Kiki Strike! It's so amaizing and scary with those giant holes showing up! @montana irregulars Wow! Did it swallow a 30 story building?! That must have been terrifying being in that building! Waaa! It's so... Waaa! This is one mystery that I HAVE TO SOLVE! Isn't there a way that people can go down there and investigate or something? I just want to go to the bottom and have a look. WOW! thats terrifying and amazing and extremely intriguing!!!! SHADOW CITY HERE WE COME!